Banning Landmines: Disarmament, Citizen Diplomacy, and Human Security looks at accomplishments and setbacks in the crucial first decade of the 1997 Mine Ban Treaty. The first half of the book considers the implementation of the prohibitions and humanitarian assistance provisions of the treaty, as well as efforts to promote universal acceptance of the treaty among governments and non-state armed groups. The second half of this book considers the impact of the landmine movement on other issues (such as cluster munitions and disability rights), as well as the extent to which it has contributed to the field of human security. 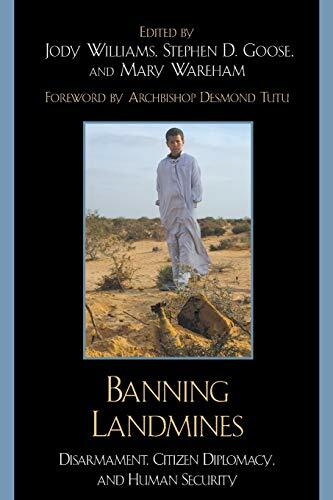 Edited by Nobel Peace Laureate Jody Williams and two other long-time leaders of the mine ban movement, Stephen Goose and Mary Wareham, Banning Landmines features contributions by grassroots activists, diplomatic negotiators, mine survivors, arms experts, and human rights defenders. This diverse group of writers at the forefront of the landmine ban movement is well placed to provide insights into this remarkable process, its precedents, and implications for other work and issues.